They carry guns and wear bullet proof vests. But more and more police officers are adding another critical tool to their arsenal: Narcan. It’s a medication that reverses the effects of an opioid overdose. It’s intended to save members of the public. But investigative reporter Liz Wagner spoke with a local narcotics detective who owes his life to a fellow deputy who had his back – and had Narcan. Liz reports in a story that aired on Sep. 25, 2018. Seconds after bursting through the door of a Hayward motel room, the Alameda County Narcotics Task Force already had the man it was hunting in custody. Ten seconds later – lips tingling, eyes burning – the veteran detective who was first through the door realized something was wrong. Pale and sweating profusely, a few more seconds ticked by as the detective stepped outside to get some air. That’s where all hell broke loose – and where the detective says he nearly died. Somewhere in that hotel room, he would later learn, the detective had been exposed to a potentially lethal dose of Fentanyl, a powerful synthetic opioid 50 times more powerful than heroin and morphine. The detective credits two things for saving his life that day: The quick thinking of his sergeant, and the foresight of Alameda County Sheriff’s Deputy Fenton Culley, who saw the opioid epidemic moving west across the country and made sure his department began stockpiling the anti-overdose drug naloxone. Because of Culley, the Alameda County Narcotics Task Force officers were some of the first Bay Area law enforcement officers to carry naloxone as a matter of protocol. “Without starting our Narcan (naloxone) program a year ago, I probably wouldn’t be here,” the detective said. Federal law enforcement officials in the Bay Area are now highlighting this incident in an effort to convince California law enforcement and public health agencies to buy in on two tools they describe as critical in the fight against the opioid epidemic. One of those tools is naloxone, something they say most police officers should now be equipped with. The other tool is something called “OD Map”, a web portal that collects real-time information from first responders on where opioid overdoses are occurring. Officials say the data serves as an early warning when bad batches of drugs, often drugs laced with fentanyl, hit the streets. Both tools have widespread use on the East Coast, where the toll of the opioid crisis has been extreme. But despite the fact that fentanyl deaths have risen by more than 400 percent since 2013 in California, West Coast police departments have been far more hesitant to adopt those tools. Federal law enforcement has come up with a tool to combat the opioid crisis and save lives. So why are so few California agencies using it? Investigative reporter Liz Wagner reports in a story that aired on Sep. 25, 2018. Culley said that’s a mistake. As the Alameda narcotics detective stepped out into the hallway to get some air, the task force’s sergeant watched as the detective’s condition deteriorated. Working narcotics, the sergeant knew what an overdose looked like, and it sure looked like the detective was overdosing. “He was ghost white, his lips were blue, he was pouring down sweat – this was not characteristic of that detective,” the Sergeant said. In one of his last memories before losing consciousness, the detective recalls his sergeant putting the naloxone into his hand. “My supervisor who was there handed [the naloxone] to me and said, ‘take this,’” the detective said. As his Sergeant watched, the detective squirted the drug up his own nose. But it was quickly apparent that one dose wasn’t going to cut it. “I saw a little bit of relief come back to him, then instantly his eyes rolled into the back of his head,” the Sergeant said. The detective’s skin turned white. Then he stopped breathing. So the Sergeant dosed him again, and this time the detective woke up. “We were removing his vest to start CPR and I thought that we were going to lose our detective right there,” the Sergeant said. But just as the detective was coming to, the Sergeant began falling victim to an overdose himself. By now, they only had one dose of naloxone left, and the Sergeant says he didn’t want to use it in case one of his other detectives began getting sick. So, the Sergeant held off taking the last dose until paramedics arrived and rushed them both to the hospital. Now, he knows the team should have been stocked with more medication: two doses per person, he says. Culley, a former member of the narcotics task force himself, also learned from that experience. He’s now trying to quadruple the department’s naloxone supply by year’s end. Since the incident, Culley says other law enforcement agencies have been bombarding him for information about naloxone and his department’s naloxone policy. 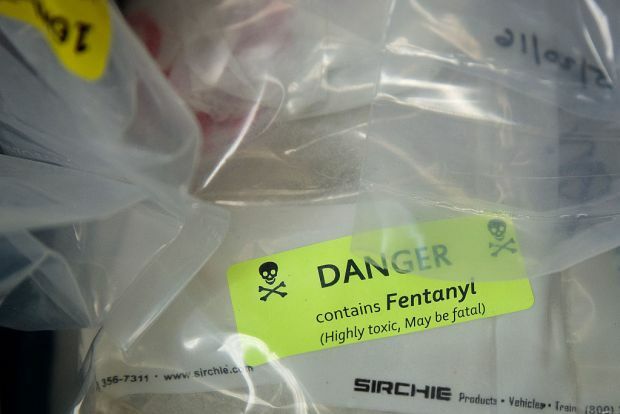 The Office of National Drug Control Policy recently released fentanyl safety recommendations for first responders, which can be read here. It was early 2016 when Justin Saens, a father of six, was looking for some relief from the pain. A bad motorcycle accident in front of his home left Saens an amputee. It also made it hard for him to work, and when Saens lost his health insurance, his sister Margaret says Justin turned to a guy selling what he thought were Norco pain pills online. Saens had no idea there was a batch of fentanyl-laced Norco pills going around Northern California at the time, which killed 12 people and led to at least 52 overdoses. The pill Saens took in April, his family would later learn, was also laced with fentanyl. Investigators, according to the criminal complaint against the man who sold Saens the pill, suspected Saens’ pill came from the same batch that had already left a trail of dead. Justin’s sister, Margaret, vividly remembers waking up to the screams of her mother, who found Justin slumped over and unresponsive in his room. Saens is now trying to warn people about the dangers of fentanyl. "The pill looked just like a regular Norco pill, just like he had taken before to ease his pain," Saens said. "But whoever manufactured the pill broke it down and added fentanyl." Her brother was not an addict, she said, just a regular, good-hearted guy trying to get some relief from the chronic pain that dogged him since his accident. The OD Map tool wasn’t around when Saens died. But supporters of OD Map say if it had been in place during that rash of overdoses, police might have been able to track the overdoses in real time and respond more quickly. “With this tool, when we have an OD in one community, they are able to anticipate where those drugs are going to go, the poisonous ones that are killing people instantaneously, and warn those people and hopefully reduce the number of deaths we are having,” said Mike Sena, Executive Director of the Northern California High Intensity Drug Trafficking Area program and the Northern California Regional Intelligence Center. Sena said OD Map asks first responders to input three pieces of information on their cell phone: Where the overdose occurred, whether it was fatal, and if first responders administered naloxone. OD Map, Sena said, is being widely used on the East Coast. But he’s trying to get more law enforcement and public health agencies on the West Coast to get on board. So far, he says, 16 California agencies have signed up. Click here for more information on OD Map from the High Intensity Drug Trafficking Area program. For Margaret Saens, who later helped law enforcement track down and arrest the man who sold Justin the pill, said the pain of losing her brother won’t ever go away. But she’s counting on Bay Area agencies to embrace this new tool that can help protect others from opioid overdoses. “If you are going to help save someone else’s family member, why wouldn’t you do it?” she said.